Posted 8 January 2019 about Island of the Hungry Ghosts + Panel Discussion. A vivid and powerful new documentary opening at the Showroom Cinema this Friday sheds light on the human impact of the Australian government’s immigration policies and their system of the ‘offshore processing’ of refugees. The film, Island of the Hungry Ghosts, takes place on the remote and extraordinary Christmas Island. 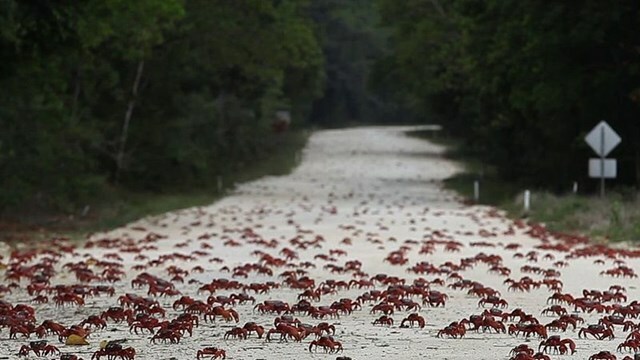 Home to few human inhabitants, the island is famous for one of the world’s largest land migrations – that of 50 million crabs making their voyage to the ocean’s edge. But the island has a much more troubling relationship with human migration. Its jungle hides Australia’s biggest offshore refugee detention centre. For the past 17 years, the centre housed refugees who arrived by boat seeking asylum - with many of them held in detention indefinitely. The centre was quietly closed in October last year, but until that point the only connection that many of the detainees had with the outside world was through therapy sessions with a trauma counsellor named Poh Lin Lee. An old friend of Lee’s, Australian filmmaker Gabrielle Brady, was inspired to make the film after visiting the island and learning more about its history and the nature of her friend’s work. Brady was immediately struck by the contrast between the island’s great natural beauty and the brutal, stark buildings of the detention centre - and the film brilliantly explores these contrasts and contradictions. The care, compassion and dignity with which Lee undertakes her work is set in sharp relief to the bureaucratic way in which the detention centre itself is run, and the profoundly dehumanising effect of indefinite detention on the asylum seekers housed there. A haunting and deeply moving study of humanity's capacity for both compassion and cruelty, the film won the Best Documentary award at New York’s Tribeca Film Festival in 2018. With Sheffield’s status as a city of sanctuary for refugees and asylum seekers, we’re delighted to be screening this powerful film at the Showroom, and at 6pm on Friday the 11th of January there will be a special screening of the film followed by a panel discussion featuring expert speakers, including the clinical director of a Leeds based organisation who offer psychotherapy for asylum seekers and refugees, and two former asylum seekers with direct experience of detention.